Anyway, on with the good stuff! Oh, how true this statement is! I have been learning this the hard way. My husband and I recently had a “discussion” in which we came to the realization that we don’t always respect and honor each other. We tried to break down this truth so we could get to the very center, and it came down to the simple fact that we are both prideful and selfish. Even though we are madly in love, we sometimes miss out on true love because we are being selfish. He and I immediately set a goal to improve. We want to honor, respect, and adore each other unconditionally and forever. As part of our goal, we decided to seek to care about the other person’s needs more than our own. It is proving to be difficult, as my “natural man” comes out more than I care to admit, but we have already reaped great benefits from our efforts. I love my husband more today than I did a few weeks ago, and that love continues to grow each day. I love my children more as I seek to be less selfish and self-centered. In return, my husband has loved me more and we have served each other in a greater capacity. My children seem pleased with the extra attention and care that they are receiving, as well. It’s a win-win. We serve others unselfishly, and they serve us unselfishly; we develop true love for one another, and that love grows stronger daily. I like it. I’m so grateful for the teachings of Christ that are taught to us by the Master and His servants. I’m grateful for living prophets and apostles on the earth who enlighten us and encourage us. 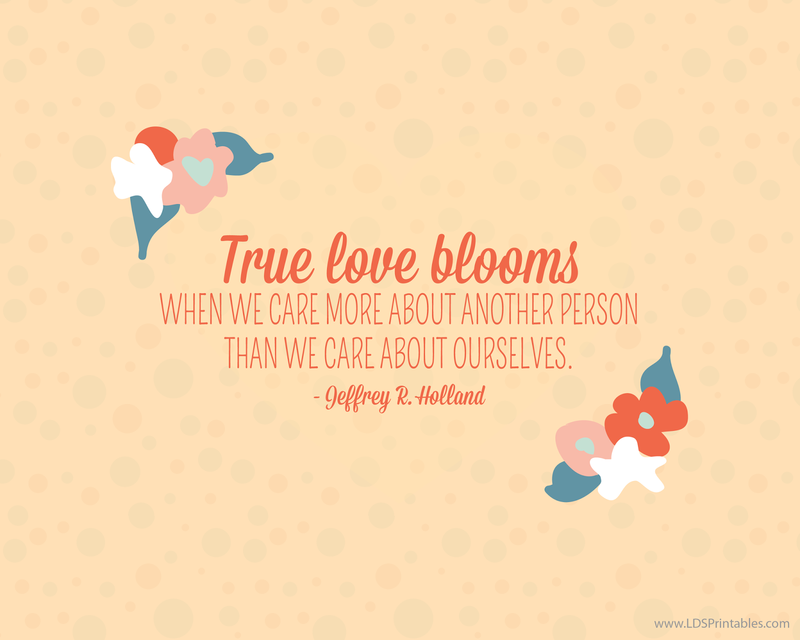 How can you this quote help your love to bloom with someone in your life? How can I prepare myself to teach the gospel? Clipart from the New Era. Points from the lesson on how to prepare to share the gospel. Quotation by Elder Joe J. Christensen from the manual. While introducing the lesson to the class, display the basket of goodies where all in the class can see. Start eating the contents of the basket and show extreme enjoyment of eating each morsel you put into your mouth, without offering anything to anyone else. (ensure no one helps themselves). While you continue to enjoy eating, ask each girl in the room to share what they love about the Gospel…. This works best in a larger group, such as Relief Society, rather than a class with just a few members. Before beginning the lesson, pass out the candy and say “I think we need a little treat before we begin”, or whatever you feel is appropriate to let the class know that it is fine to eat the candy at that time. It is also helpful to eat one yourself….